Breeding success for one of the rarest birds in Canada, first chicks bred in Meaford, Ontario. 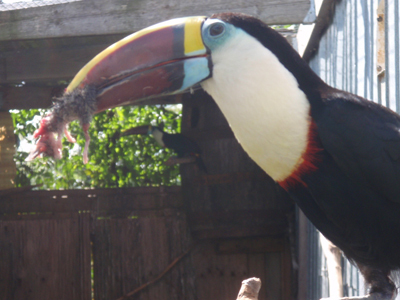 On the 21st of August 2010, St. Vincent Birdpark successfully hatched their first Red-billed Toucan (Ramphastos tucanus) chick. St. Vincent Birdpark is a new private institution owned by Mr. David Tavares Longo where most of the collection from Longo�s Aviaries Inc. has been transferred ownership to the birdpark. St. Vincent Birdpark is located in the lush green forests of Meaford, Ontario which provides an oxygen rich oasis for approximately 100 species of exotic birds, with emphasis currently on psittacines and ramphastids. St. Vincent Birdpark currently keeps one pair (1male:1 female) and one additional single female of Red-billed Toucans which were imported in February of 2004 from Suriname by Mr. Longo. Suriname is the smallest country in the north region of South America between Guyana and French Guyana above Brazil. The 2 most challenging obstacles one will find in attempts to reproduce toucans in our country is climate and sufficient sized enclosures. Ramphastids require high temperatures as their native ranges true to the equator in northern south and central America which reflect average ranges of 24-32�C and humidity levels of 60-90%. The species has proven challenging to breed in captivity in Canadian climates and until this most recent hatching, this family of birds has never been reproduced by any zoological institution or no birdkeepers in the private sector in Canada. The breeding pair housed at SVBP laid a clutch of two eggs, one of which proved to be fertile when hatched on August 21, 2010. We cannot document what occurred with the second egg, whether it was fertile or infertile or if it hatched. Friday August 27, we captured a couple of images from the log, albeit blurry ones and found one healthy baby. 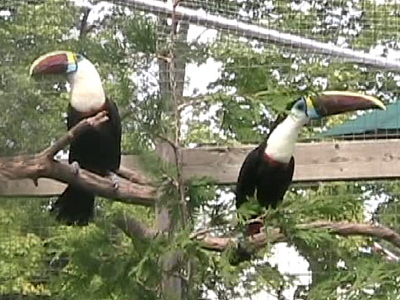 The select handful of birdkeepers and zoological institutions in Canada (which is far and few between) that do house toucans have been incapable to offer the indoor/outdoor facilities to accommodate the specific requirements of this family of birds. Our Canadian winters limit us to keep them outdoors throughout the whole year except for the province of British Columbia, there still exists no known parties who keep them in this province. 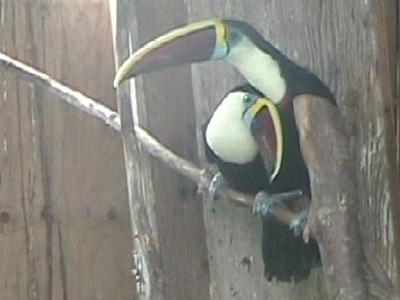 They are not as agile with climbing ability as parrots are with their beaks so toucans have been designed over thousands of years to compensate by stronger leg design maintaining strength in balance just as parrots would compensate flight to use their hooked bills to manipulate agility using the beaks as a third leg for climbing. This also enables the toucans to encourage flight because they are not as nimble, they require more space to utilize their nature to jump and fly wherever they need. One of the key factors of no success in summer of 2009 was Ontario had no summer, it was essentially one long spring leaping into fall and temperatures rarely kept over 23�C and a trained eye can see they were patiently waiting for this warm weather to arrive before even considering raising a family. Birdkeepers that do tend to have larger collections of psittacines and other tropical birds only keep birds out for 6 months on average in Ontario. Here at St. Vincent Birdpark we push to keep them out minimum 7-8 months depending on species and climate. This helps the birds for 2 reasons, first it helps them believe they have an extreme amount of time available to reproduce and second the spring and fall season cold helps their immune system boost with the colder weather and increases their resiliency for harsh climate and disease. We strive to continue our utmost to ensure privacy for the pair and strictly encourage all our birds to rear their young when possible. Thus we did not interfere by removing eggs for artificial incubation in hopes to receive parent imprinted offspring for future breeding to preserve this species in captivity. We have policies for intervening when parents are human imprinted and may show subtle hints or signs of possible harm to young. In these rare instances, we are always prepared to step in and will remove 25-50% of the eggs or chicks to ensure some chicks will survive to adulthood during those seasons in particular and will reintroduce the young with other birds so as not to allow their imprinting on us humans. 1) top left - pair enjoying weather conditions and keeping eye on me; male is on right with larger beak. 2) top right - pair courting; female displays cuddling and affection towards male weeks prior to mating. 3)female enjoys tenderizing a mouse the pair caught in the aviary, we did not offer mice due to concerns of iron storage disease (I.S.D.) however, they still require good sources of protien for chick's first few days of life. Not a typical portrayal or image of a toucan's diet. 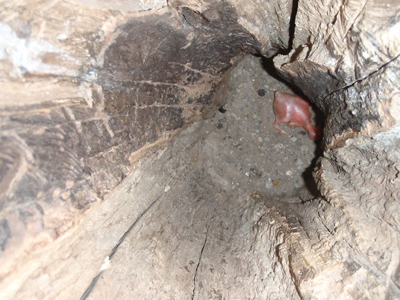 4)photo taken of the one baby in nest log at 7 days of age. Note the chicks do not have any down to assist in keeping warm due to them originating from equator, heat is sufficient for chicks survival.